Sony just unveiled the Xperia Z1 at IFA last Wednesday; it’s featuring a 5in full HD 1080p touchscreen, a quad-core 2.3GHz processor and Google’s Android 4.2.2 Jelly Bean mobile operating system. As we can all see right away, the Xperia Z1 is like a heavily upgraded version of its predecessor, and the most obvious one is the new super-sized 5-inch HD screen – the?pixel density?is incredibly high at 441 ppi. This greatly increased the fun of playing games or enjoying movies on portable device, especially some HD 1080p movies. Maybe you have a large Blu-ray/DVD collection and wonder how to transfer them to Sony Xperia Z1 for playback? Just follow this article, you will find it could be so simple. How to playback Blu-ray/DVD on Sony Xperia Z1 with best video quality? Step 1. Get Blu-ray to Xperia Z1 Ripper. Download and install the Pavtube BDMagic or BDMagic for Mac, a professional and top Blu-ray ripping program that will help to remove disc encryption from film studio, and convert Blu-ray/DVDs to 1080p/720p MP4 for playback on Xperia Z1. 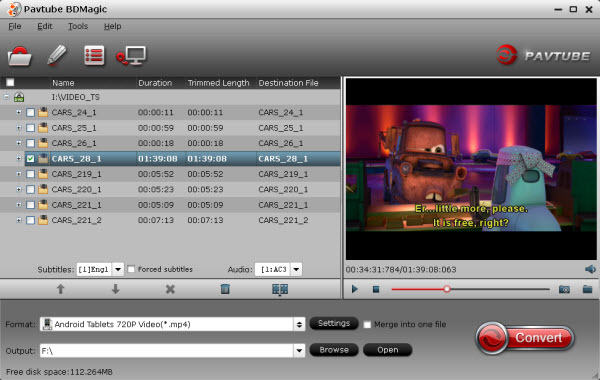 Read More: Top 5 Blu-ray Ripper Software Review Step 2. Load Blu-ray or DVD Disc. Get this program installed; click the top icon to import from disc drive, ISO/IFO or folder. It can extract the media inside ISO file directly. Step 3. Choose target video format for Sony Xperia Z1. 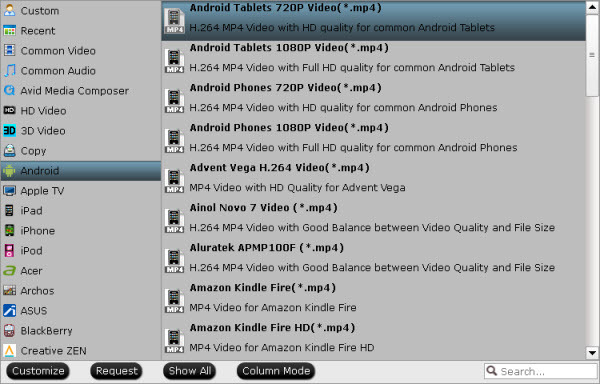 Click the drop-down list on the bottom, you will find various presets for different programs and devices. Switch to “Android” tab and check Android Tablets 720P Video(*.mp4) as the best video format for Xperia Z1. 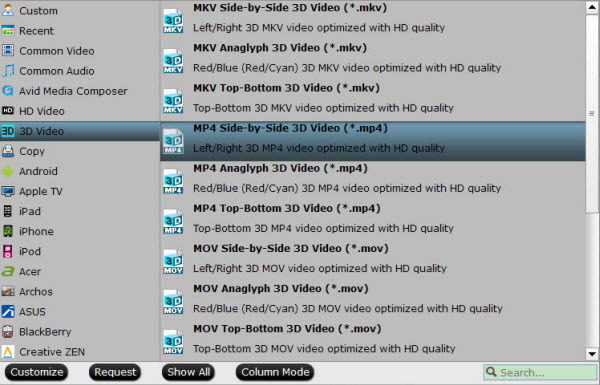 FYI: you are also able to output Anaglyph/Side-by-Side/Top-Bottom 3D MP4 like this: Tips: Customize video specs. (Optional) Click the “Settings” on bottom, you can find settings for video codec, size, bitrate, frame rate, sample rate(Hz) and so on. Free change them according to your own needs. (FYI: the higher bitrate you choose, the better video quality will be.) Step 4. Start Ripping Blu-ray/DVD to Sony Xperia Z1. Click the “Convert” button to start ripping Blu-ray/DVD movies to MP4 for Sony Xperia Z1. There’s no need to wait in front of screen; just check “shut down computer after conversion” and you can leave it working. Or you can check “Open output folder” to quick locate the converted video. OK, now we get the Blu-ray or DVD movies ready for Xperia Z1; use an USB cable to transfer these movies to Xperia Z1 internal memory or SD card. This entry was posted in Android and tagged convert blu-ray dvd to xperia, playback blu-ray on xperia z1, put dvd to xperia z1, transfer dvd to xperia z1, view blu-ray on xperia z1 by vina. Bookmark the permalink.